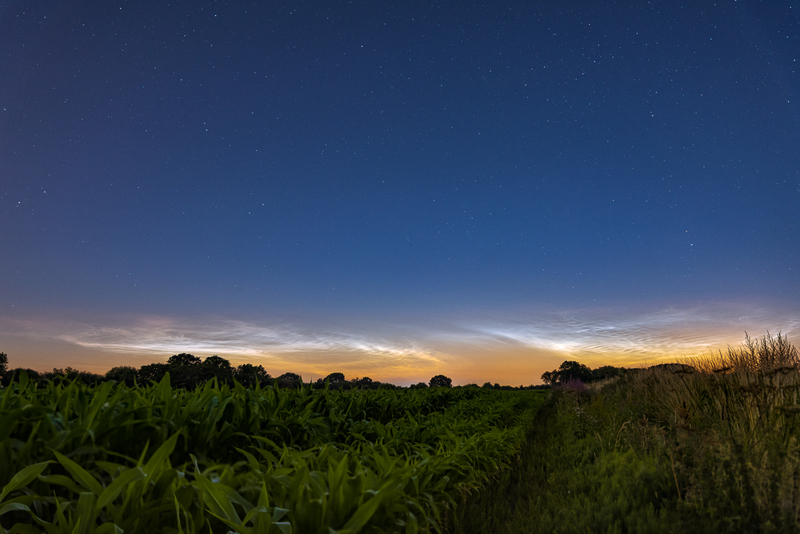 Noctilucent (Night Shining) Clouds over North Doncaster. They are typically observed during the summer months from latitudes between 50° and 70° north and south of the Equator. 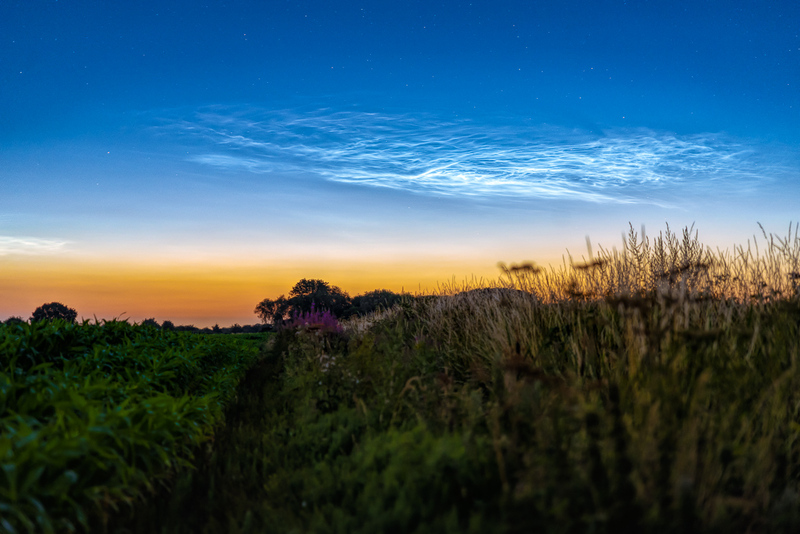 They only be seen during local summer months, when the Sun is below the observer's horizon, the clouds are at an altitude of around 50 miles, so are still in sunlight. They consist of ice crystals which reflect the Sunlight to the observer's location. The focal length of the lens is 70mm. This image was taken on the same early morning as the other image but a little later on after the moon had risen. The cloud had moved somewhat and the light from the Moon and approaching dawn provided more ambient light. The sky is 10s and the foreground is 30s @ f2.8 ISO 800. The focal length of the lens here is 35mm. the foreground consists of 5 images stacked for NR and then focus stacked which works I think here even though it is not perfect. It was still relatively dark, the sky is 13s and the foreground is 45s, @ f2.8 ISO 800. 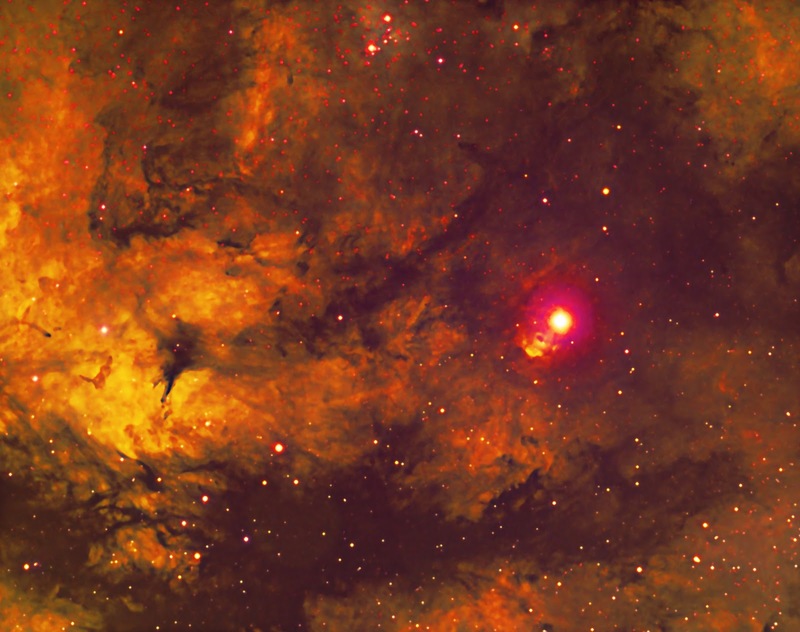 Gamma Cygni is a bright star superimposed upon an extensive region of nebulosity only part of which is shown in this frame which is a combination of 6x600s Ha,5x600s O111 and 1x600s S11 exposures, applying the Hubble palette, taken on 11.7.18.The camera a sxTrius694 was attached to a Takahashi 106 refractor. 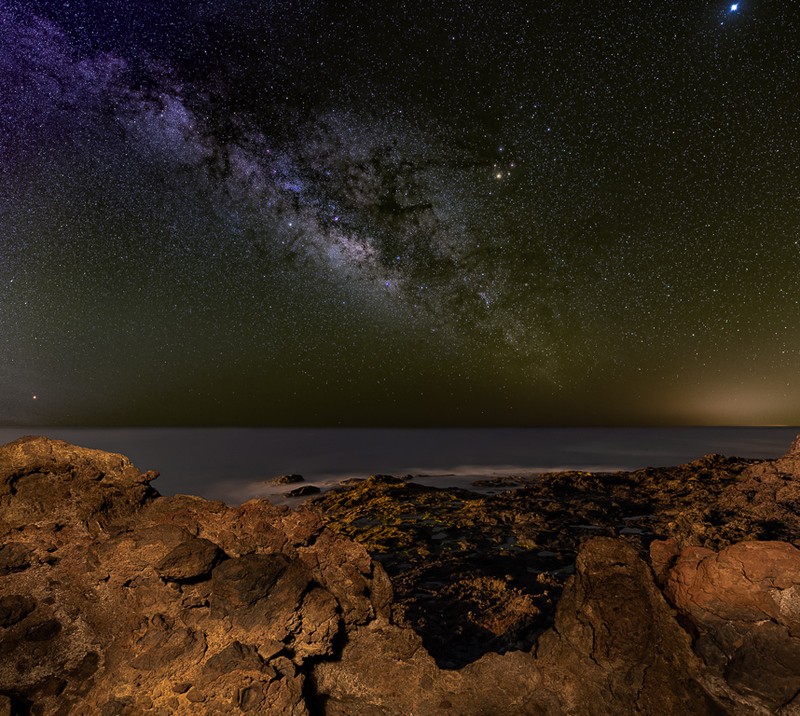 Imaged from Lanzarote, Mars can be seen just above the horizon on the bottom left, Saturn is close to the centre of the image to the left of the Lagoon and Trifid Nebulae and Jupiter is the very bright object at the top right of the image. which helped somewhat but doesn't do much against the white LED light that came from the towns to the left. It also left that purple colour cast to the top left, but I quite like that here. It did a decent job on the orangey light on the right which is from the next-door island of Fuerteventura. I have used artistic license a little on Mars and the Rho Ophiuchi Cloud Complex by enhancing the colours somewhat. Nikon D750, Sigma 14mm f1.8, Skywatcher Star Adventurer Tracking Mount. Sky stacked in Nebulosity 4 for NR, then processed in PS & LR. Foreground processed in PS & LR and then blended with the sky in PS.